A beautiful designer engagement ring that features a split-shank setting with .35 carats of pave diamonds on both sides of the 14k white gold band. Set it with a princess, radiant, or emerald cut diamond of your choice and you'll have a jaw-dropping engagement ring! Exquisite designer engagement ring with 2 rows of micropave diamonds decorating the band, 4 small diamonds on either side of the center diamond, and an additional row of micro pave diamonds going around the basket that the center diamond sits in. This ring can be set with a round diamond only. Cool ring with 3 bands that swirl together at the top. If you are known for standing out from the crowd and that is what your lover enjoys about you, she is going to love this amazing, unique engagement ring in 18k white gold. This ring is as unique as it gets because of the six marquise shaped diamonds that complement the kite set diamond of your choice. This hand-crafted designer engagement ring features pave diamonds flowing around the contoured 14k white gold band, 2 diamonds on either side of the prongs, and your center diamond, of course. 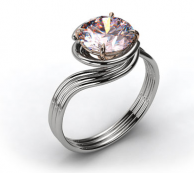 This ring can be set with a round diamond only.